My name is Astu, i have gone through your profile here and decided to contact you. I want to be friends with you. I will also want you to reply me so that we can exchange photos to know each other more. I have some important discussion with you. I am very sorry if i may violate your policy or in any way hurt your feelings by intruding into your privacy, actually it's true that I don't know you in person and it's not compulsory that you must help me, but before that I will like you to make sure you keep this business secret and confidential if you are interested to help me out. I am Miss Astu Daima, 24 years old, Liberia by nationality and the only daughter of my late parents Dr. James Daima. I lost both parents in the war that took place in my country Liberia last time. I am the only surviving member of the family since other relatives were killed in the war. This led to my escape to Senegal now where i am staying as a refugee under the United Nations Refugee Commission. I am anxiously waiting for your urgent response so that i will give you the bank's details where the money is deposited. I add my photo for you to know me more. I thank you very much for your response to my proposal and it gave me a great joy after reading from your hopeful mail. I will like to hear your voice on phone, please call me from our priest's phone. His name is Rev. Gabriel Ngbuu, he is the priest in charge of Christ The King Mission here in Dakar Senegal. His number is: +221781574909, just tell him that you want to speak to Miss Astu Daima (the Liberian girl) and he will send for me to come to his office and speak with you. I have been looking for a trustworthy person who will not betray, deny or sit on the fund when it finally comes to his or her care and I thank God that I have seen you as a dependable person whom I can confide this transfer to his hand without fear and i will be with you over there in your country as soon as this fund is transferred to your account successfully and i am well pleased for your help. I am here now offering you 15% of the fund for your assistance and 5% for any expenses that you might make during the process of the transfer, i promise you immediately the money arrived in your account just take 20% of it, i purposely did that for your appreciation. Dear please fill in your information in the below letter, copy it and send to the bank. FINANCE MANAGER Mr. Stephen Hester. Sir, my name is...... from.............. I would like to know the legal procedure of transferring this fund into my bank account in my country. My partner Astu is in refugee camp in Dakar Senegal which you are aware of and she will not be able to reach your bank. That is why she has asked me to stand in for her to receive this fund from your bank. So Sir, I need the details on what to do to get the fund transferred into my bank account at the earliest time. Your urgent response to my request will be highly appreciated. Head/office: 36 St Andrew Square Edinburgh, SCO EH2 2YBP Scotland. For your kind attention Mr. . I have been directed by the Director of Financial Officer/Wire transfer to write you in respect to your partner's mail which we received earlier. Actually the Executive Board Management of RBS has earlier been informed about you by the young lady the next of kin (Ms. Astu Daima) that she wishes you to be her trustee/representative for the claim of her late father's deposit with this bank. Her late father (Dr. James Daima) is one of our late customers with some substantial amount with our bank here in Scotland. Hence you have been really appointed as a trustee to represent the next of kin. However before our bank will transact any business concerning the transfer of the fund to your bank, we will like you to send the followings immediately to our bank. Should you have any question (s) please contact our Chairman Executive Operational/Director of Finance Officer Mr. Stephen Hester through his telephone number +447031889225 or email for more clarifications and directives. My dearest, i hope you are fine. I am really glad to read from you and to read the bank's response. Honestly my dear, it is my heart desire to leave this bad situation and come to be with you. Look at my photos, i know that i am good looking from what my friends say and i was born and brought up in wealth, but here i am begging for food and cloths, depending on humanitarians to live. Your email has truly given me fresh hope and i see myself leaving this bad situation to live a comfortable life again. I am convinced that you are an honest person and i have no doubt that you will live up to your words. You can call me any time from 9.00 to 17 GMT London time because Senegal shares same time zone with London. I hope you can be able to work out the difference. 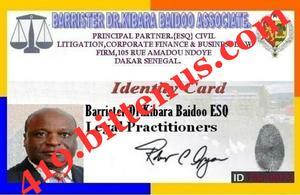 Our priest has helped us in finding a lawyer to get us the power of attorney and affidavit of oath as the bank demands and he told me that this lawyer is the best financial lawyer here in Senegal. I have even submitted the deposit certificate of the fund and the death certificate of my late father to the lawyer as he demanded to initiate and register the transaction with the federal high court here. He gave me the contact of the lawyer. Please don't fail to do this immediately. I look forward to reading from you as soon as you contact him. Take care of yourself and have a nice day. waiting to hear from you as soon as you contact him. God bless you and your family. REF: JLC/01541 YOUR REF: LMC /0549, Case No; 015181/013. Ur Ref; Letter of Authorization. 07/11/2014. Sequel to your request to issue to you an authorization letter for you and your partner that will enable you to stand on your partner's behalf to transfer her money from Royal Bank of Scotland PLC to your account in your country or elsewhere. Prior to my inquiries from the bank to ascertain the authenticity and legality of such transaction, I was made to understand by the bank that there are 4 documents required by them before the transfer of the money to your account. 1. 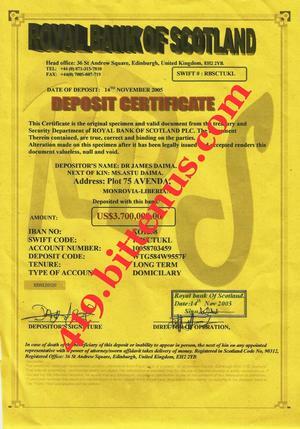 A copy of the deposit certificate. 2. 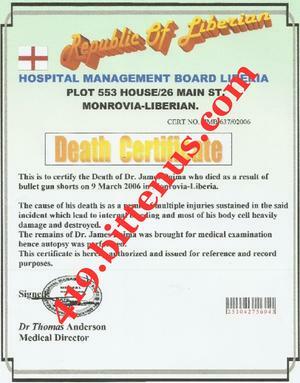 The death certificate of late Engr. Felix Houphouet Kada. 4. An affidavit of oath which will enable the bank to deal with you on behalf of your partner. In view of the above and from my inquiries from the high court here in Dakar Senegal today, it will cost the sum of 200 Euro for authentication of the power of attorney, 200 Euro for swearing of the affidavit of oath at the federal high court here before it becomes valid, 200 Euro for notary stamping at the notary office (before it will go out from Senegal here) and our legal processing fee of 250 Euro. Total (850 Euro only) to get everything done.